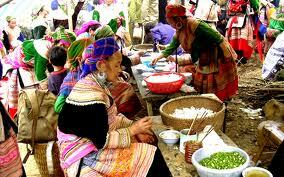 There’s no dancing or singing, but Coc Ly Market in Laocai Province always turns colorful and festive on Tuesdays, when ethnic people gather there to buy and sell goods, dine and drink, or just wander to enjoy the ambience of the montagnard market. 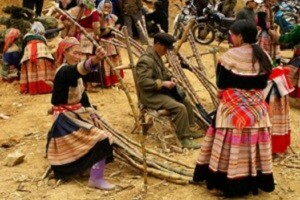 Many ethnic traders from Bac Ha and other parts of Lao Cai Province dress up in colorful costumes and bring horses, chickens, buffaloes, vegetables or whatever they can sell to the festive market in the wee hours, and will not return home until 1pm. 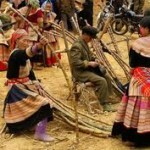 Certainly, what catches the eyes of visitors most are the different colors of the costumes worn by ethnic people and the handicrafts they sell at the market, about 50 kilometers from Laocai City in the northern province. 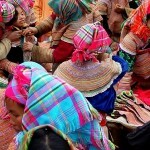 You can see young and old Hmong women, wearing skirts and hats with different types of embroidered flowers, crowding the market during the opening hours of Coc Ly. Scarves, clothes, decorations and other items made of tho cam (ethnic fabric) on sale also add color to the bazaar by the Chay River. 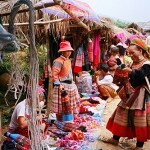 The colorful items are put on sale not just for locals but also tourists, particularly foreigners. However, you should remember to bargain when you want to buy your favorites, and the items at the booths located at the start of the path you walk on always have higher prices. 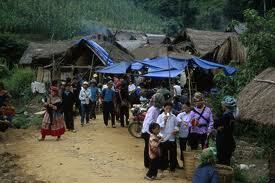 Keep walking toward the end of the traditionally ethnic market until you find a real bargain. A good idea is to stroll every corner of the once-a-week bazaar as you listen to unexpected conversations, see nice surprises and learn how ethnic people sell and buy farm produce, life’s necessities and other things.